When I discovered that journalist Ethan Gilsdorf had written a book about gaming and fantasy culture, my first reaction was to curse his name for beating me to the punch. But if anything, Gilsdorf’s Fantasy Freaks and Gaming Geeks proves that the topic of why people chose to inhabit imaginary realms is so meaty that a single book couldn’t possibly cover everything. Gilsdorf’s tome operates as a sort of survey of the fantasy world. He begins with Dungeons and Dragons, which he became involved with as a teen in the 1970s, and which he used to escape the reality of his mother, who survived a brain aneurysm but returned to her family as the “Momster,” crippled, and with short-term memory problems. From there, Gilsdorf fasts forward to the present day, when he rediscovers his old D & D character sheets in a blue cooler in the basement, and sets off on a quest that will take him to Pennsic, gaming conventions, a Georgia LARP, Azeroth, wizard rock shows, and ultimately, to New Zealand to see the land of Lord of the Rings. He finds that there are many answers to the question, “Why do people get involved in imaginary worlds”? Sure, like his teenage self, some people want to escape, but it’s more complicated than that. Each hobby seems to have its own answer. SCAdians (members of the Society for Creative Anachronism), yearn for a return to a medieval past, but the society also endows its members with noble values, chivalry, that transfers over into regular life; while World of Warcraft allows a wheel-chair bound woman stricken with a crippling muscular disorder to walk again, at least virtually. Gilsdorf is at his best when his writing is rooted in reporting, such as his stint visiting Guédelon, a project in Burgundy, France, where workers are creating a medieval style fortress using medieval-style methods and while dressed in period clothing. He treats his subjects with respect, striving to understand the reasoning behind their hobbies. 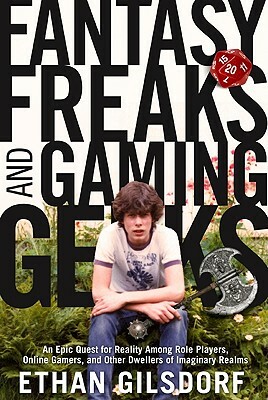 A worthy read for anyone involved in a fantasy subculture or anyone who wants to understand what it’s all about. Stay tuned next week for a post on my conversation with Ethan about gamer shame! This entry was posted in Blog, Creative Writing, Larp and tagged Dungeons and Dragons, Ethan Gilsdorf, Fantasy Freaks and Gaming Geeks, gamer shame, Guédelon, Lord of the Rings, Pennsic, Society for Creative Anachronism, World of Warcraft by Lizzie Stark. Bookmark the permalink.